Window moisture is indicative of a larger problem. Over time, this moisture can lead to mold, mildew and eventually rotting of the trim and window framing. Just to be sure though, check for leaks around your window. Obviously, this would just occur during rainy weather. The moisture from that leak could then show itself again as condensation on the inside of your window. In most cases, a leak is not the issue, but it is a good place to start. 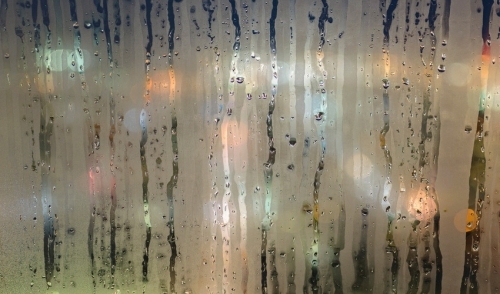 More than likely, your windows are telling you that there is too much humidity in the home. This is a problem that is more prevalent with older, single pane windows. It is caused by condensation, in which the moisture in the air condenses when as touches a cold surface (your window), much like a cool glass of water that sweats on a hot day. There are a couple ways to approach this problem. If your windows are of the old, single pane variety then perhaps replacement windows would be a good option. Energy efficient, dual pane replacement windows can create an insulated buffer that will substantially reduce or eliminate condensation --not to mention the benefits of energy savings and ease of operation that you will also enjoy. Installing storm windows over single pane windows is another possible solution. If replacing your windows is not viable at this time, you can try to reduce the humidity levels in your home. There are a few ways to go about this. The use of ventilation fans in both kitchens and bathrooms can greatly control moisture, since those are the rooms of the house that produce the most. Make sure your clothes dryer is properly vented outside. If so, inspect the dryer vent to make sure that it’s still attached and cleaned out. Sometimes, in cases when the dryer had been moved for some reason, the vent can be pulled free and will pump moisture into the home. Consider purchasing a dehumidifier to keep your humidity levels down. If you already have one, inspect it to make sure that it is working properly. Houseplants and aquariums also add to the humidity of the home. Consider covering aquariums to help keep levels down. If your condensation problem is in an area of the home that has an aquarium or a large number of plants, consider relocating them. Inspect the gutters and drains around the home. Sometimes if water is not properly diverted away from the home’s foundation, excess moisture can enter the home from below. Remember, having new energy efficient windows, with everything all nice and sealed up, is definitely a good thing. However, your new windows may be too good at their job and won’t tell you much about the humidity levels in your home (unless of course the humidity is extremely high). To reduce the risks of high humidity levels which, beyond creating condensation, can also promote mold and mildew growth, consider purchasing a hygrometer to keep track of your home’s humidity levels. A good rule of thumb is: In the winter, if the outside air is below 15 °, your indoor humidity should not exceed 30%. In the summer, the levels should not exceed 55%.